Global fund of hedge funds have witnessed a dramatic change of fortunes over the last two and a half years. The industry grew at a steady pace between 2003 and early 2008, with assets under management peaking at US$826 billion, before suffering considerable losses and widespread redemptions1amid the global financial crises. After losing US$393 billion between March 2008 and July 2009 – a drawdown of nearly 48% – industry assets seem to have stabilised around the US$450 billion mark. Performance has also been healthy in 2009 and 2010 – the Eurekahedge Fund of Hedge Funds Index was up 9.39% in 2009 and 1.54% in year-to-date September 2010. The figures below show the growth in the fund of funds industry over the years. 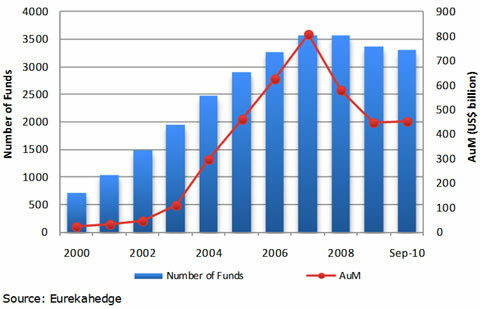 After witnessing massive outflows in 2008, which were exacerbated by poor performance and some high-profile frauds, total AuM in the funds of hedge funds industry fell to US$433.7 billion by July 2009. However, the trend of redemptions slowed down as the global economy recovered from the downturn and multi-managers started to post some positive results. Nevertheless, subscriptions remained weak through most of 2009 because of scepticism among the investors who had previously suffered due to losses or lock-ups. The full article is available in the EH Report accessible to paying subscribers only. 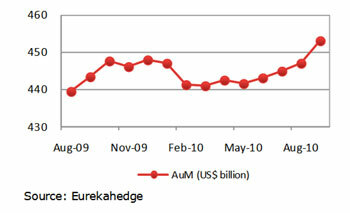 1 For a detailed analysis on FoHF losses in 2008-2009, please refer to the Eurekahedge 2009 FoHF Key Trends Report.